Bruce Moeller, and his wife, Christina Moeller, plotted with an alleged drug dealer, Daniel Caceres, to rob a gambler at Jake's 58 Hotel and Casino on May 11, according to an indictment made public Tuesday. 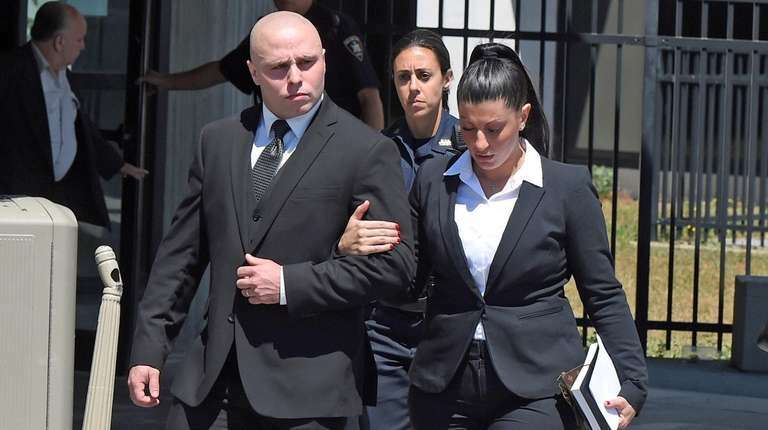 A Nassau County police officer and his wife — charged in two separate conspiracies to rob an Islandia casino and one of its customers — pleaded not guilty Tuesday at their arraignments in a Riverhead court. Bruce Moeller and his wife Christina Moeller plotted with an alleged drug dealer, Daniel Caceres, to rob a gambler at Jake’s 58 Hotel and Casino on May 11, according to the indictment. All three are from Port Jefferson Station. The Moellers — each arraigned on two counts of conspiracy in the fourth degree — declined to comment as they left Suffolk County Court. “In this case, as it continues, it will be clear that this is not what it appears on its face,” Bruce Moeller’s attorney, William Petrillo of Garden City, said in an interview outside the courtroom. According to Petrillo, Bruce Moeller, 32, is an upstanding citizen who had served in the U.S. Marine Corps for eight years, finishing two tours in Afghanistan. “He has received approximately nine medals for his heroic combat in action while overseas,” Petrillo said. Thomas Spreer of Babylon, the attorney for Christina Moeller, 29, said Suffolk prosecutors had not provided him with any evidence, so it was premature to conclude his client committed any crimes. Both Spreer and Petrillo, however, declined to say what those defenses were. 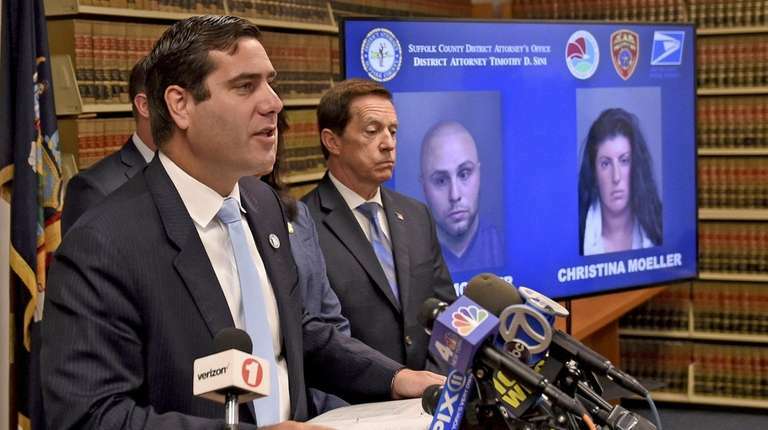 According to the indictment, Christina Moeller, 29, who worked at the casino as a cashier, on May 11 took a photo of the high-roller ­— who Suffolk County District Attorney Timothy Sini had said won more than $50,000 — and sent his picture to her husband. On the same day, Bruce Moeller, and Daniel Caceres, 29, drove to the casino, according to the indictment. 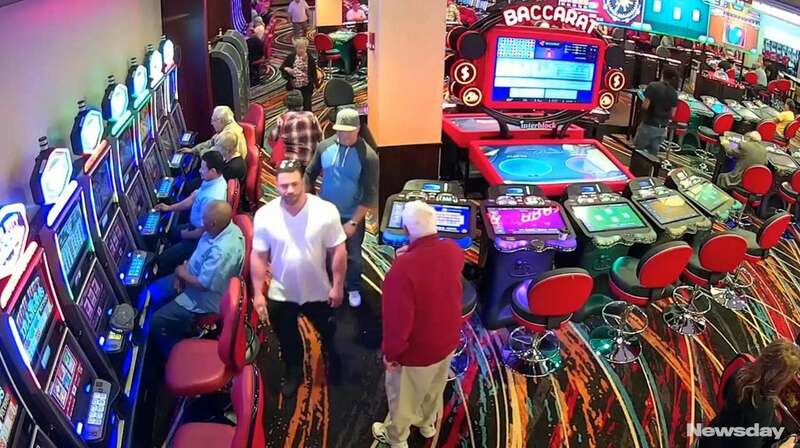 Moeller flashed his Nassau County Police Department badge, entered Jake’s 58, and searched the casino, looking for the patron that his wife had singled out to be robbed. “On May 11, 2018, Bruce Moeller brought firearms to the location of Jake’s 58 Casino,” the indictment said. Sheila Kelly, a spokeswoman for Sini, declined to identify the patron, named “Cupcakes” by the Moellers, or say whether the guns Bruce Moeller allegedly carried into the casino were issued by Nassau police. Law enforcement officials learned about the robbery conspiracies while they were investigating Caceres, who authorities said had been leading a ring that distributed marijuana, cocaine and other drugs since October 2016. Caceres and two other Nassau County police officers were among 11 people arrested and charged in connection to the drug operation. Bruce Moeller, who joined the NCPD on Feb. 6, 2015, has been suspended without pay. Christina Moeller, who worked at the casino for about a year, is suspended from her job, according to her attorney. “Right now, their world is upside down,” Spreer said. Suffolk County Court Judge Timothy Mazzei, who allowed the Moellers to remain free on bail while they await their trials, ordered the couple to return to court on Sept. 13 for a status conference. If convicted, each faces a maximum of 1 1/3 to four years in prison, Kelly said. DA: Cop, wife charged with plan to rob casinoA Nassau County police officer and his wife have been arrested by Suffolk authorities on allegations they conspired to rob an Islandia casino, the Suffolk County district attorney's office said. Crime in Nassau and Suffolk, 2006-2017 There were 35,503 violent or property crimes recorded on Long Island in 2017 by the state's Division of Criminal Justice Statistics, a 5.7 percent decrease from 2016. 5 ways to send story tips to Newsday Do you have information that might lead Newsday to an important story, or an investigation? A document that starts us on the trail? Here are five ways for you to send our journalists tips, documents and data with a range of security options.